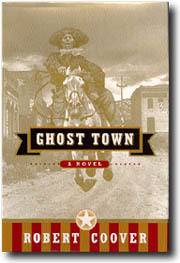 Reinvigorating the exhausted western, Robert Coover's Ghost Town (Henry Holt and Company) is at once a novel about the American cowboy and a postmodern parody of its genre. Coover, AM'65, concocts a crew of ghostly townspeople with a penchant for the bizarre, engaging them in morbid, innuendo-laden versions of the usual gunfights, bank heists, and barroom brawls. His nameless protagonist, "the stranger," stumbles through this phantasmagoric cascade of events, narrowly avoiding his demise. Thrust into the position of sheriff soon after arriving in town, the stranger is thrown headlong into the town's warped reality. His futile attempts at justice are complicated by a supporting cast who-much like extras in a low-budget spaghetti western-often rise from the dead to reappear later in different disguises and roles. The stranger's requisite love interest, the town's schoolmarm, is too engaged in correcting the townspeople's fractured grammar to receive him. But when she is sentenced to the gallows, the stranger fights to save her-and himself-from the town that haunts his every move.-M.D.B.